In October of 2010, Google launched Place Search, which was a big change for its local search results. As part of the change, Google began clustering information in the search results for specific listings. The clustered results include information from a number of sources, including CitySearch, Yelp, TripAdvisor, etc. You can see a screenshot below of what the clustered results look like in Place Search. By providing clustered information directly in the search results, Google’s goal was to aggregate rich local information so users could find what they needed without having to dig. This information was usually contained just on the Place Page for a given result, and not in the search results. As I mentioned earlier, there are several sources of information that Google is pulling from in order to provide the clustered information for local businesses. Additional sources to the ones I mentioned above include InsiderPages, Expedia, UrbanSpoon, Zagat, etc. As I was performing research for a client, I came across an interesting addition to the various sources of clustered information in local search. I saw Groupon showing up! That’s right, the clustered results for some listings provided links to Groupon reviews for the company at hand. 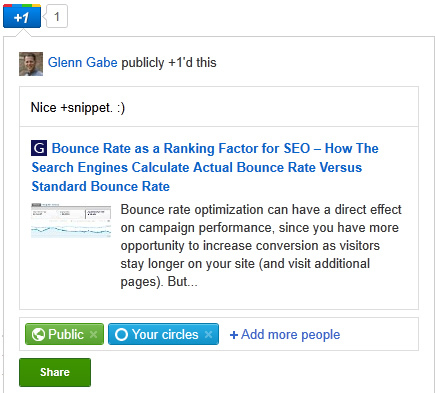 To clarify, the link in the clustered results took me to the Groupon page for the specific company. So, if a local business was ranking highly in Place Search, and it had run a Groupon (or multiple Groupons), I saw a link to the Groupon page directly in the search results. See a screenshot below of this happening. Although my immediate reaction was positive, I quickly started to think about the implications for local businesses. For those of you unfamiliar with Groupon, it’s an extremely popular group buying site. And by “popular”, I mean it’s big (and hot) enough that it turned down a $6 billion offer from Google to buy the company. Instead, they are supposedly preparing for an IPO. OK, So What’s the Problem With Groupon in the Clustered Results? Here’s the biggest problem. All of the Groupons I came across were expired. That’s right, when you click through the link in the clustered results, you end up at the Groupon page for the business (with the expired discount staring you in the face.) 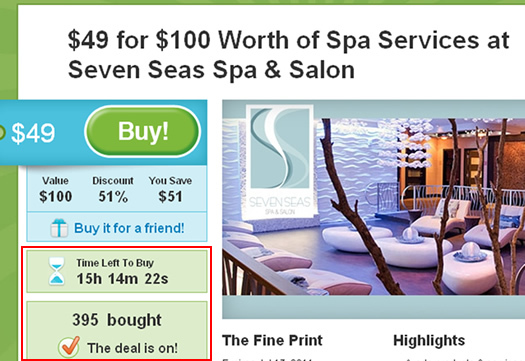 Imagine a customer searching for a spa treatment, finding your Groupon page (where you provided a huge discount), then finding out they can’t get that discount, and then possibly taking measures based on that fact. Some people may push for the discount, others may wait for the next Groupon (based on the extreme discount), and others might simply wonder why you offered such a large discount in the first place. None of these situations are great for local businesses, as they can be hurt by their past promotions. Google is essentially embedding links to those discounts into the local results (via the clustered information). I know several businesses that have run Groupons with varying levels of success, but I’m not sure any of them want their expired Groupons front and center for prospective customers to see. My research also revealed something that could be alarming for some local businesses. 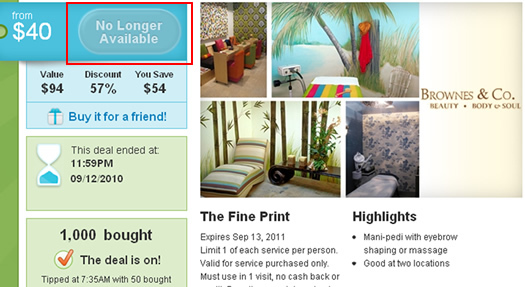 On the expired Groupon page, there were other LIVE Groupons for competitors! That’s right, prospective customers visit your expired Groupon page, only to realize they can’t receive your discount, and then they are presented with live discounts from your competition. Wonderful. And remember, these are heavy discounts, not 10% or 20% off. Many are over 50% off… See screenshot below for an example. Form a plan for dealing with the “Re-Groupon”. When you launch a Groupon, understand that it can possibly show up down the line (when prospective customers are searching for your services). Have a plan for communicating why customers either will or won’t receive the Groupon pricing they found in the clustered results. If you don’t want your Groupons showing up in the search results, you can ask Groupon for help. Note, I have no idea if they will help keep your Groupons out of the search results, but it’s worth asking. This can potentially apply to both the standard search results and the clustered results in Place Search. Just be aware that this can potentially hurt your Groupon when it’s live. For example, people searching for it on Google won’t be able to find it as easily. Also, Groupon appears to be marking up their pages using rich snippets, which enables Google to collect structured information that can show up in the search results. You can ask Groupon to not mark up your pages. Again, I don’t know if they will do this for you. Summary – Should Groupons Live Forever? It’s one thing to have helpful information show up in the clustered results of local search, but it’s another thing to provide links to heavy discounts, for very specific promotions, after they have expired. As a local business, you might end up trying Groupon to see if it works for your company, and that’s a good thing to do. But, you should also understand that the massive discount you are offering could haunt your business for a long time (beyond your Groupon expiration date). That’s especially true if a link to the discount shows up front and center in the search results of Google. For better or for worse, Google never forgets. You’ve mapped out an incredible online marketing strategy. Your developers have been frantically working to meet your deadlines, the creative is approved, dates set, and your campaigns are almost ready to launch. Everyone is excited. But, are you missing one critical element that can literally save your campaigns? You just might be… One important thing I learned early in my career is that your online marketing campaigns are only as good as the servers they are run on. For example, imagine driving thousands of people per day to a site that is down 25% of the time. Imagine an e-commerce site that bombs during checkout 10% of the time. Or worse, imagine you receive so much attention and traffic that your site is down for days at a time (wasting significant amounts of budget and an opportunity to land new customers). This is the reality of online marketing, and unfortunately, many marketers learn the hard way how important hosting is to their success. I remember launching a large-scale campaign for a client after starting my own business. There was a critical decision I needed to make as we set up their hosting. I could go with dedicated hosting or go with a webfarm (where multiple servers work together to balance the load). The webfarm was more expensive and we didn’t know the exact amount of traffic the campaign would generate, so it was a hard decision. I decided to go with webfarm hosting, and I was lucky I did. The campaign drove over 950K visits to the site in just a few days (based on the viral nature of the video content). The webfarm didn’t even hiccup. We experienced no downtime, even though the site was getting hammered from all directions. How did I know that we didn’t experience downtime? I set up server monitoring so I would know immediately if one of the servers went down. It was relatively easy for my hosting provider to set up, cost me very little, and enabled me to know exactly how the webfarm was performing. When server monitoring is set up, the web server in question is pinged at a certain frequency (like every second or minute) to ensure the server responds. If it doesn’t, an email gets immediately triggered to you and a ticket will be set up with technical support. Yes, this is brilliant and can save your campaign from technical failure. In addition to pinging your web server, you can also set up monitoring for your mail server. If you heavily rely on email for your business (which most business owners do), then this can also be an invaluable service. Similar to web server monitoring, the mail server can be pinged every x seconds or minutes to ensure uptime. If it’s down, an email will be triggered and a support ticket opened. Again, this is a smart thing to do for online marketers. So, you’re sold on the idea of server monitoring, but don’t know where to start. No problem. First, you need to understand the hosting package you have set up and the various services that your hosting provider offers. 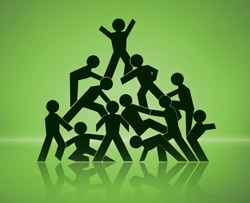 For example, do you have a shared hosting package, dedicated package, virtual private server, etc? Is monitoring offered for certain packages and not others? Then you need to find out how much monitoring costs and what you need to do in order to have your provider set it up. I recommend giving technical support a call and speaking with them about the possibilities. Also keep in mind that monitoring will require that your hosting provider is fine with complete transparency. This could separate the great hosting providers from the good ones. You will know every time the server goes down and for how long. This could be somewhat uncomfortable for certain hosting providers, especially if they aren’t confident in their service. You might find that some hosting providers will set up monitoring for free and others that will charge a small monthly fee. For example, it might cost you $5-$10 per month per server (and per monitor). If you had a monitor set up for your web server and one for your email server, then it might cost you $10-$20 per month for monitoring. Needless to say, that’s a small price to pay for being confident in your hosting setup (especially if you or your clients are launching several online marketing campaigns). Imagine you were spending tens of thousands of dollars (or more) on the campaign. What’s $5 or $10 per month?? I recommend having monitoring set up for both your web server and mail server. Then you can be confident that your site is up and running and that you can receive email. When setting up the email address for the monitor (the address that will be emailed if your server goes down), don’t use an email address at your domain. Use a gmail address or another web-based email account. If your mail server is run on the same machine that runs your web server, then you won’t get the email notification when your servers goes down… :) Find out from your hosting provider if your mail server and web server are on separate machines. Make sure the monitor emails you when the sever goes down and when it’s back up. Then you can identify the true downtime that the site experienced. Have your hosting provider test the monitor once it’s set up. Then you can make sure you are in fact emailed and that a support ticket is opened. Like everything else in technology, testing can save you from an embarrassing situation. As you can see, I believe server monitoring is extremely important for online marketers. Don’t let web server downtime ruin your online marketing campaigns. There’s nothing worse than doing your job well as an online marketer and then having a server fail. If that happens, your campaign fails along with the server. If visitors cannot get to the site in question, then you’re dead in the water. 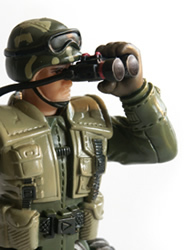 Think of your monitor as an online marketing scout that will watch over your servers. A scout that never sleeps, checks your servers continually, takes no sides, and can save your campaigns. Set monitoring up now. Hi. My name is Glenn Gabe and I’m lactose intolerant. That’s right, me and about 40 million other Americans. Although it’s not the worst thing that can happen to you, it’s definitely a bit of a downer. I was 32 when I figured out that I was lactose intolerant, and that’s also when I learned how much of a nuisance it was to exclude certain foods from my diet. And those foods were some of my favorite things to eat, including milk, cheese, pizza, ice cream, to just name a few. Cheese, in particular, is in so many foods and meals that you eat on a regular basis, that it’s almost impossible to avoid. Now, that’s assuming that I really do have to avoid cheese. More on that shortly. I was making lunch about a month ago when it happened. I’m typically stuck using some flimsy science cheese for my sandwiches or choosing from the anemic selection of lactose free cheeses available. That day my wife ended up taking out her favorite cheese, which is Cabot Extra Sharp Cheddar. By the way, that’s like dangling a gourmet sandwich in front of a person that’s been stranded on an island for 5 years. :) After a quick glance at the cheese, I wiped the drool from my face and went back to my science project, I mean lunch. That was until my wife glanced at the side of the Cabot packaging. She noticed a small message on the side of the package that read “Lactose FREE”. Huh? I dropped my sandwich on the floor and ran over. Was this a mistake? Are they messing with me? I checked to make sure I wasn’t being punk’d and then I started doing some research. After doing some searches, I couldn’t believe what I was reading… It ends up that MOST aged cheeses are lactose free. From what I gather, the aging process yields cheese with either very low amounts of lactose or 0 grams of lactose. That includes cheddar, swiss, romano, provolone, etc. Needless to say, I was ridiculously excited. I’m not sure if all the cheeses listed have 0 grams of lactose, but most have such a low amount that they cause no problems for lactose intolerant people. Where Were The Cheese Companies? I couldn’t help but think of the massive revenue impact of effectively promoting this message to targeted people. 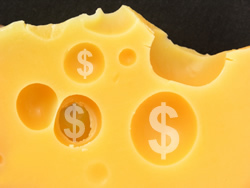 How could cheese marketers get the word out via a number of channels? I don’t know about you, but a target market of between 30 and 50 million lactose intolerant people provides a pretty darn good opportunity. And the fact that many of those people are dying to eat the foods they once loved (like cheese) makes it even a stronger opportunity. If cheese manufacturers or the cheese industry, decided to launch a thorough marketing and education campaign, I can only think they would strike gold. Simply getting the word out that most cheeses are low in lactose, and many are lactose free, could be a windfall for the cheese industry. There’s actually nothing to sell… your target market wants to eat cheese. They just can’t eat it (or so they think). A well-crafted campaign combining TV, Viral Marketing, Social Media Marketing, Search Marketing, Blogger Outreach, etc. could be huge for the cheese industry. It could be a cheese extravaganza! Jim: Hey Laura, you can’t eat cheese, right? Laura: Yes, unfortunately I’m lactose intolerant… Are you rubbing it in? Jim: No, I just saw a video on YouTube explaining that most cheeses are low in lactose and many have no lactose at all… You should check it out. If I ran marketing for a cheese company and I was looking for ways to increase revenue, I would launch a killer campaign that engages the lactose intolerant market. Why try and get a .5% lift from the people who already buy and eat cheese when you can get a much greater lift from people that are dying to eat cheese, but just THINK that they can’t.